Need a little refresher on what you’ve learned? Here’s a library of articles to help you out. We’ve rated each project by level of difficulty, with 1 as easier and 5 as more challenging. Any project that involves risk to you or your property has a minimum difficulty of 3, though the work itself may be fairly simple. You already know this, but we have to say it: please read our disclaimer before downloading these files. We’re always working to add new projects to the library, so check back often. By using the Service (as defined below), the user (“You”) agrees to be bound by all of the terms, conditions and notices contained in this disclaimer. K2W provides generalized instructions on how to complete home repair, maintenance and remodeling projects. K2W also lists contact information and ratings on a variety of Service Providers to You (collectively the “Service”). 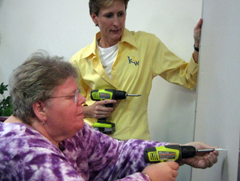 K2Workshops, LLC (“K2W”) provides generalized instructions on how to complete various home repair, maintenance and remodeling projects. K2W does not provide specific instructions on individual projects that You may have. K2W also lists contact information and ratings on a variety of service contractors ("Contractors") that You might interview and consider for any individual project You might have. You acknowledge and agree that all content and other information on the Website, including, but not limited to, all text, graphics, logos, icons, images and downloads (collectively, “Content” ) are the exclusive property of K2W, and such Content is hereby declared as Copyright Materials and is protected by all United States and international copyright laws. You expressly understand and agree that K2W will not be liable for any direct, indirect, incidental, special, punitive, compensatory, consequential or exemplary damages (even if K2W has been advised of the possibility of such damages) (collectively, "Damages"), resulting from: (a) the use or inability to use the Service; (b) the cost of any goods and/or services purchased or obtained as a result of the use of the Service; (c) disclosure of, unauthorized access to or alteration of your information or Content; (d) content You submit, receive, access, transmit or otherwise convey through the Service; (e) statements or conduct of any Service Providers or other third party through the Service; (f) any other matter relating to the Service; (g) any other dealings or interactions You have with any Service Providers (or any of their representatives or agents). These limitations shall apply to the fullest extent permitted by law. In some jurisdictions, limitations of liability are not permitted. In such jurisdictions, some of the foregoing limitations may not apply to You. You agree to indemnify, defend and hold harmless K2W, its officers, managers, owners, employees, agents, designees, users, successors, assigns, Service Providers and suppliers from and against all losses, liabilities, expenses, damages, claims, demands and costs, including reasonable attorneys' fees and court costs due to or arising from: (a) any violation of this Agreement by You; (b) the Content or other information provided by You to K2W or that You submit, transmit or otherwise make available through the Service; (c) Your use of the Service; or (d) any violation of any rights of another or harm You may have caused to another.